Plastics – a quick list! This week, Bolder (see previous post) posted new challenges, one of which challenged people to stop using plastic bottled water for a day. Bottled water has many negatives- from the quality of the water (future blog post!) to the leeching of chemicals from the plastics used to bottle it. Bolder’s challenge got me thinking about plastic containers of all sorts. Open your cabinets- most people have stacks of plastic bins, Tupperware-style storage containers, boxes of ziplock-style baggies, not to mention all the plastic containers our food, cleaning supplies, and hygiene items come in! By now, many people have become accustomed to checking the number on the bottom of these items to see if it’s recyclable in their communities. But what else can these numbers tell us!? These numbers can tell you which ones are safe and which ones are hazardous to your health! Hazardous plastics have been used for common sports water bottles as well as baby bottles and baby food containers! 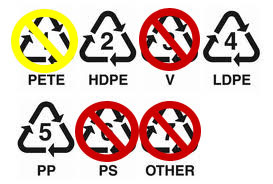 Your best bet, in addition to posting the chart above, is to try and avoid plastic containers and packaging all together. You will quickly realize how much plastic is used in America. The raw materials needed to produce most plastics come from petroleum and natural gas. See, it’s not just our cars that are contributing to the massive need for petroleum! Don’t use the grocery store’s plastic bags for produce! Use a reusable produce bag instead – many companies are making them: Blue Avocado, EcoBags, or you can check Etsy too! Buy food from bulk bins if your grocery offers it, then store in glass containers like mason jars! We do this for lots of stuff- popcorn kernals, sugar, croutons, pasta noodles, pretzels, etc. Opt out of using plastic grocery bags at the check-out. Take your own cloth bag! I have about 15 or so and that covers a full trip to the store. Many places now offer a small discount for using your own bags too! If more and more of us refuse to use these unsafe materials it will make an impact! In the meantime, do your health a favor and stop eating and drinking chemicals from plastic!! For our first post I want to share a change my fiancé and I made recently. This change in particular is probably the best change I’ve made this year. We joined a local CSA — Jacob’s Cove! “CSA” stands for community supported agriculture. 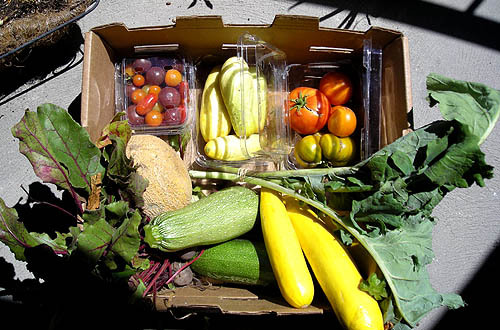 CSAs offer fresh (often organic), seasonal, and local foods to its members for a pre-paid fee. For this fee, the members get a “share” of food at regular intervals. Most often the food is fruits and vegetables but some CSAs also offer other farm fare such as dairy products, meats, flowers, etc. The CSA model offers great advantages for both the farm and the consumer. The payments help the farm with cash flow and crop planning. This can allow a farm to focus on (and achieve) the high quality and variety of the food they grow. The consumer also benefits from the healthy addition to their diet, the adventure of discovering new foods to prepare, and the comfort of knowing exactly where their food is coming from- and knowing they are supporting their local economy. Both parties benefit from the relationship that is fostered between the producer and consumer. For example, CSA farms often offer members the ability to come out and visit the farm. So why does this change in our lifestyle excite me so much? First of all, I’m far too aware of the strange things being done to the produce in most grocery stores. Just the waxing used to make the produce shine is gross enough- let alone the high probability of pesticide residue! Ick! Not to mention, massive agriculture companies have been getting a lot of publicity regarding soil erosion, contamination of water supplies, and ecoli/salmonella outbreaks! I like knowing where my food is coming from and knowing it’s being grown in ways that limit negative impacts on my health, my community, and my environment. We are now two weeks into our membership and we absolutely love it. So far we’ve gotten: heirloom tomatoes (big and small), beets, zucchini (2 kinds), yellow squash, cucumbers (2 kinds), collard greens, chard, cantaloupe, sweet bell pepper, and chili peppers. We get 1 share which is the perfect amount for the two of us for a week. The quality of the food was immediately evident- it just SMELLS good. And the taste- wow- the tomatoes are like candy! We’ve enjoyed getting stuff (like beets) that we don’t usually buy. Just in one week we discovered about 3 new recipes! That is going to add some fun new variety to our meals! Our CSA is also a year-round operation because they have a portion of their farm under green houses. This is another exciting benefit! We will be eating fresh tomatoes through the winter! I highly encourage you all to look for a local CSA and to really attempt to work it in to your grocery budget. Eating safe and healthy food is extremely important- for more information about CSAs I recommend this page (MNN- CSA) from Mother Nature Network that lists multiple stories about CSAs.